See Sarah Swatch: Serum No. 5 Review! Hey ladies! Remember my post from yesterday about Serum No. 5 Shrinking Violet? I now have 3 more Serums to share with you today:] Before the pictures, I'll talk about the application: on all 4 of these polishes, the application was really great. 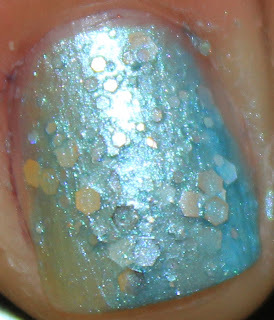 Great amount of glitter and all were opaque in 2 coats [except for the glitter topper obviously]. Also, all the polishes were seriously just pretty. Okay, onto the pictures. 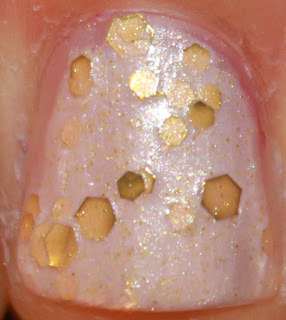 I love the shimmery base and the big gold glitters in this one. So hard. But it's really the little teeny gold glitters that steal my heart. It doesn't look like it should make much of a difference, but I love how it added an overall sparkliness to the whole polish. My favorite combo of this was over Runway Pearl. Whitish polishes with gold glitter are so appealing to me. Also, I love the holographic glitter in here. It makes the polish so interesting! Okay, I won't lie, this wasn't my favorite of the Serums I got. I think the foily base covers the glitter a little too much for me. That said, I like it a lot more IRL. The overall color is really pretty and at an armslength away, it's way prettier. 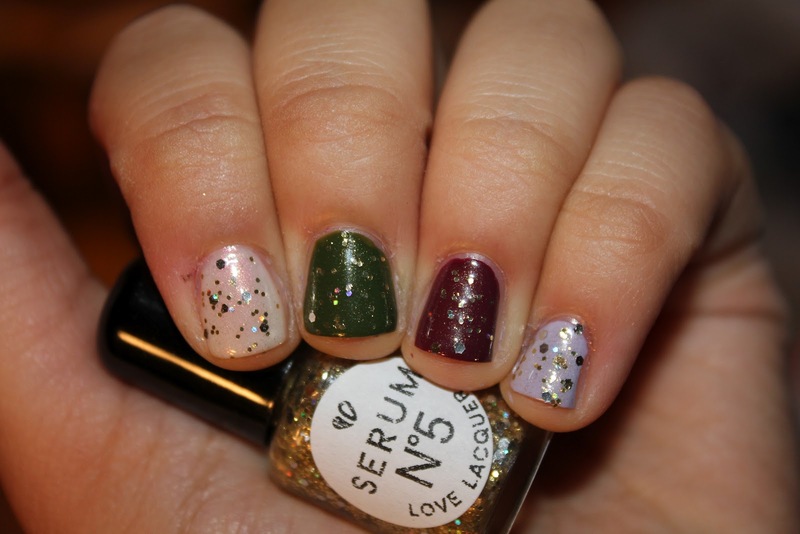 What do you think of these polishes?? I think my favorite is Girl's Gotta Eat, I fell hard for that stunner. I want to put it over every polish ever. Especially neutrals. GAH!! I like Girl's Gotta eat, it is so cute! I really love Peachy Keen!! Very lovely!!! The gold one is gorgeous!